First of all, this is one of those rivalries that has all the classic hallmarks. The two places are almost across the street from each other, and have been competing for literally generations. Both have their staunch adherents who look upon a visit to the other as a flagrant sin. And as an added touch, they even have competing color schemes: with Modern sporting red lettered boxes and red-and-white string against the blue-lettered boxes with blue-and-white string of Mike’s. Getting takeout cannoli (and who wouldn’t?) from either place means you are advertising to all of Boston which institution you prefer. But amongst all of that, unlike some rivalries, there is a distinct difference between the actual pastries. A typical cannolo from Modern is quite the expression to behold. It’s a delicate creation, a very light and crispy shell, definitely more of a pastry wafer than a cookie. The ricotta is distinctly thicker and more substantial as well; it’s definitely not a light ricotta filling, and it’s even a bit chunky. 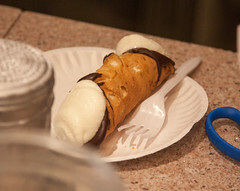 It’s also a smaller product then the competing cannoli from across the street, which are figuratively the 800 lb gorillas of the North End cannoli scene. But here’s where Modern really has what I consider to be the most important difference: Modern fills their cannoli to order. Each shell sits there dry and ready to go until the second you order them, upon which they are instantly pipped full of that great filling, allowing the end product to be much crisper and fresher. To me, the real decision comes to consumption. If you are getting your cannoli primarily for immediate consumption, Modern is the way to go. If taking a bunch of cannoli home to friends? Most of the difference will be gone in an hour, and the greater size and variety of Mike’s wins out. 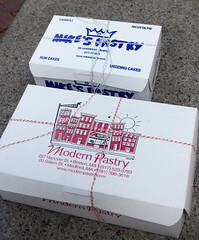 And there’s always something to be said for the Florentine Cannoli of Mike’s as well. But really, I think most everyone should embrace the fact that they’ve got a choice of great cannoli bakeries.